Inzamam-ul-Haq pronunciation ;Punjabi, Urdu: ?????? ????? ; born 3 March 1970), also known as , is a former Pakistani cricketer. He is widely regarded as one of the greatest batsmen Pakistan has produced. He is the leading run scorer for Pakistan in One-Day Cricket and second-highest run scorer for Pakistan in Test cricket, after Javed Miandad. He was the captain of the Pakistan national cricket team from 2003–07 and is considered to be one of the best leaders in Pakistan Cricket history. Inzamam rose to fame in the semi-final of the 1992 Cricket World Cup, in which he scored 60 off 37 balls against a strong New Zealand team. His strong batting performance also propelled Pakistan to victory in the final of the 1992 Cricket World Cup. He remained one of the teams leading batsmen throughout the decade in both Test and ODI cricket. In 2003, he was appointed captain of the Pakistan team. His tenure as captain ended after Pakistans early exit from the 2007 Cricket World Cup. 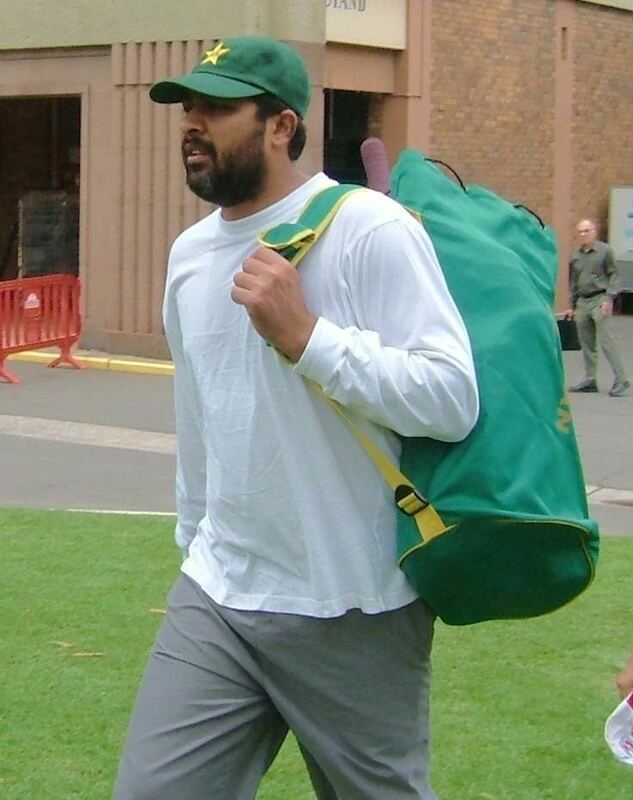 On 5 October 2007, Inzamam retired from international cricket following the second Test match against South Africa, falling three runs short of Javed Miandad as Pakistans leading run scorer in Test cricket. Following his retirement, he joined the Indian Cricket League, captaining the Hyderabad Heroes in the inaugural edition of the Twenty20 competition. In the ICLs second edition, he captained the Lahore Badshahs, a team composed entirely of Pakistani cricketers. Inzamam-ul-Haq is a prominent member of the Tablighi Jamaat, an Islamic missionary organisation, and remains an influential personality in Pakistan cricket. Inzamam made his (ODI) debut in a home series against West Indies in 1991, and made a good start to his career by scoring 20 and 60 runs in two matches against West Indies. This was followed by 48, 60, 101, and 117 runs against Sri Lanka. Inzamam made an equally vital contribution in the final of the World Cup, scoring 42 runs off just 35 balls, helping Pakistan reach a score of 249 after a sluggish start. These innings established Inzamams billing as a big-game player, although he was unable to replicate his World Cup success in later tournaments. 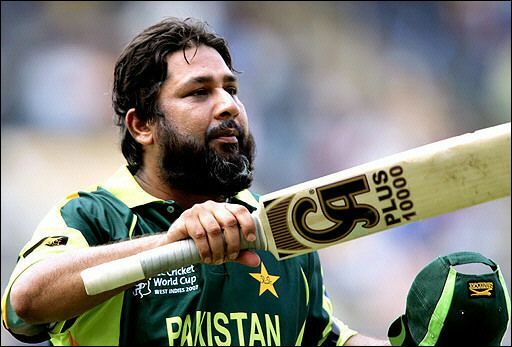 Inzamam has been known to be a very destructive batsman in both One Day Internationals (ODIs) and Test matches. He has the ability to pick the length of a delivery very early and play very late. His footwork is generally considered to be fast, enabling him to position himself early for shots. He averaged just under 50 runs per innings in Tests and nearly 40 runs in ODIs, with a strike rate of 54.03 and 74.23 respectively. Inzamam is especially strong when playing shots off his legs and has been considered to be amongst the best employers of the pull-shot in world cricket. His batting style has brought him fans from all over the world. He was called "the best batsmen in the world against pace" by Imran Khan, because "he seems to have so much time on his hands before the ball reaches him". Inzamam captained Pakistan in thirty Tests, winning eleven, drawing nine and losing ten. Only three players have captained Pakistan in more Test matches, but all have better win-loss records and only Imran Khan has a lower win percentage than Inzamam. Although the Oval Test match in 2006 was poised as a victory for Pakistan before the controversy took place and had it not occurred, Inzamams record would have had a win more and a loss less. However, Inzamam held the captaincy until March 2007, the longest captaincy tenure since 1992, when Imran Khan retired. In a 1997 Sahara Cup match against India in Toronto, Inzamam assaulted a member of the crowd, Shiv Kumar Thind, a Canadian-based Indian, who had been comparing Inzamam to several kinds of potato over a megaphone. According to eyewitnesses a cricket bat was brought out by the Pakistan teams 12th man, Mushtaq Ahmed, who then waited at the boundary with the bat. Television replays confirmed those statements. newspaper quoted another eyewitness as saying "If not for the spectators and security staff curbing him, he would have broken the head of that guy. The guy with the megaphone was no match for Inzamam and got mauled. Even when Canadian police took Inzamam back on to the field, he was trying to get back to the stands."